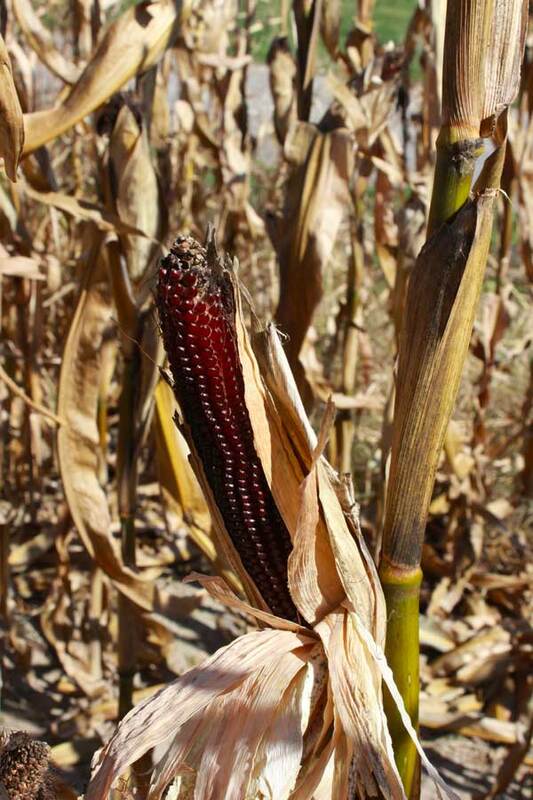 Below a closeup picture of a Ruby Red popcorn cob, dry enough to harvest. I pulled the husk down part way so you can see the color of the cob. The color of the kernels is red, can you guess what color the popcorn is after you pop it? . You guessed it? The color of the popped popcorn is white.Our friend Mya is holding a partly husked cob of Mixed Baby Rice popcorn, you can see the silk which lays on the cob, inside the husk. 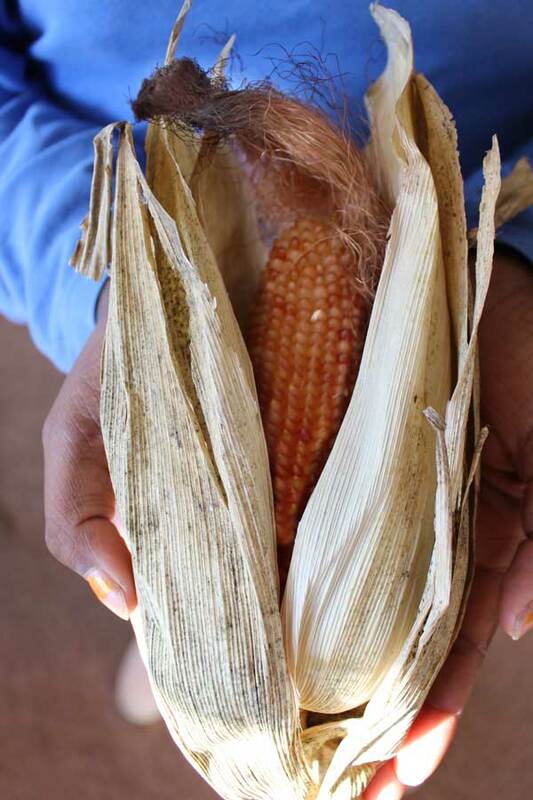 The kernels are pink and creamy colored, they also pop up white. We don't grow strawberry popcorn every year, the cobs are very small and they are difficult to harvest. You can see the size of the cobs next to Dara's hand. The stalks don't grow tall. 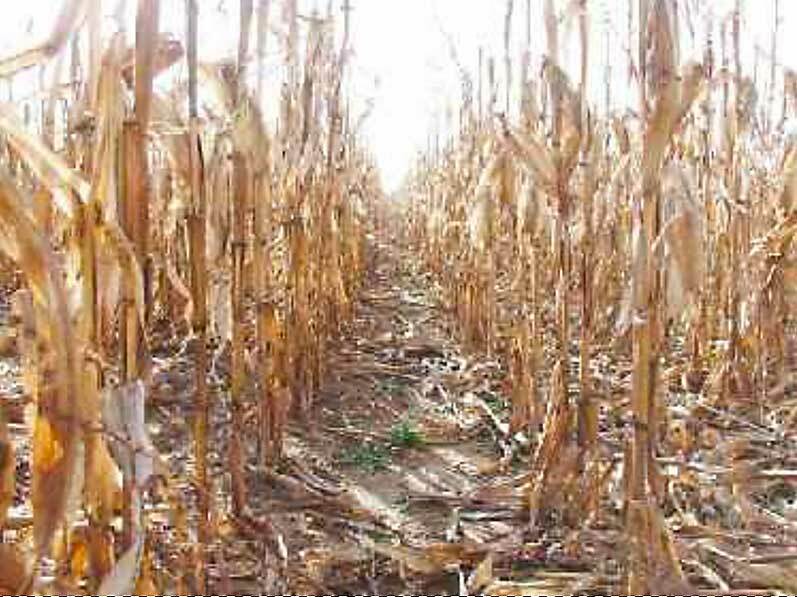 The field below has had one pass of the Uniharvester, you can see the stubble that is left. The trees in the far background are tamaracks, they turn colors in the fall. 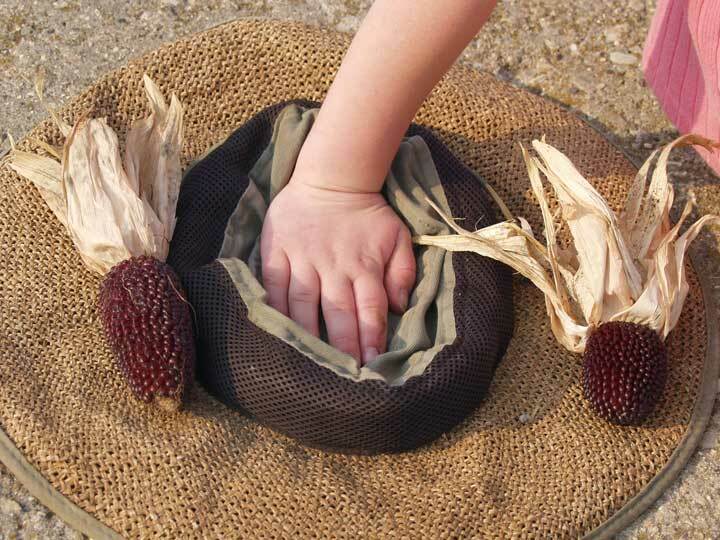 What do we use to harvest the popcorn? 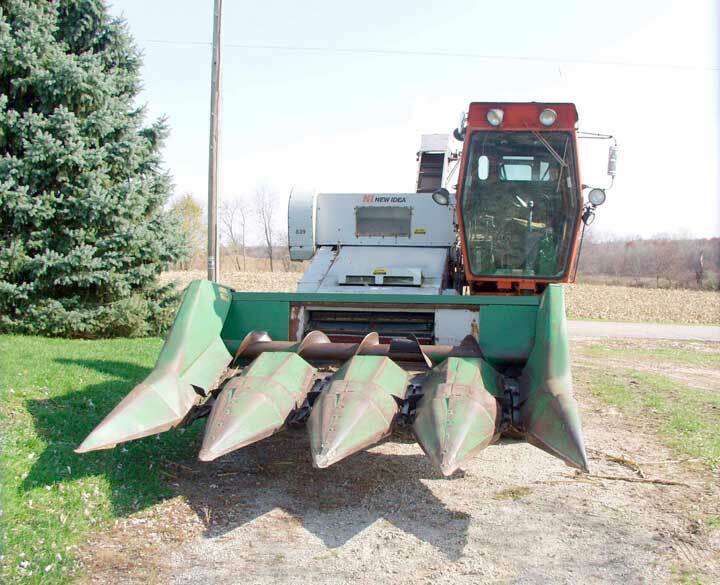 The machine you see next is our Uniharvester. The head will harvest 4 rows of popcorn at a time. 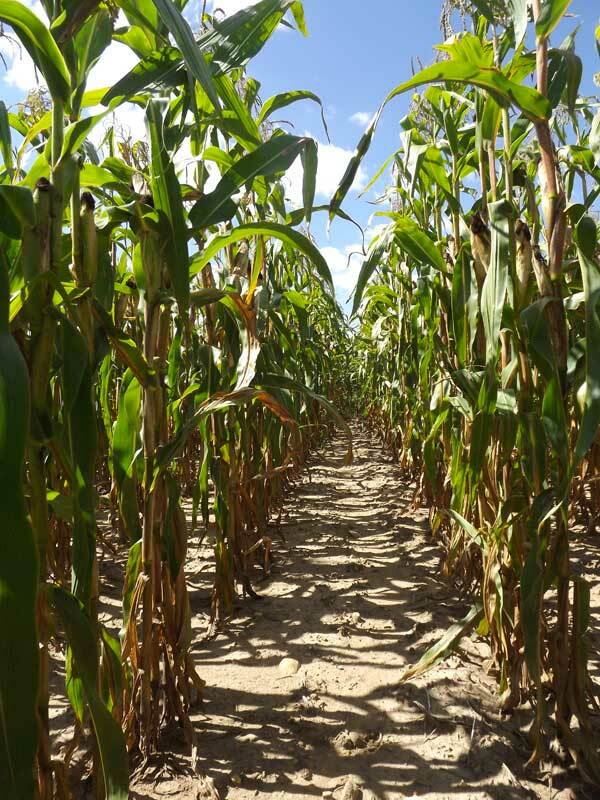 Behind the long "pointy teeth" which cut the corn stalks is a auger which takes the corn from the teeth and moves it continuously into the middle of the "throat". 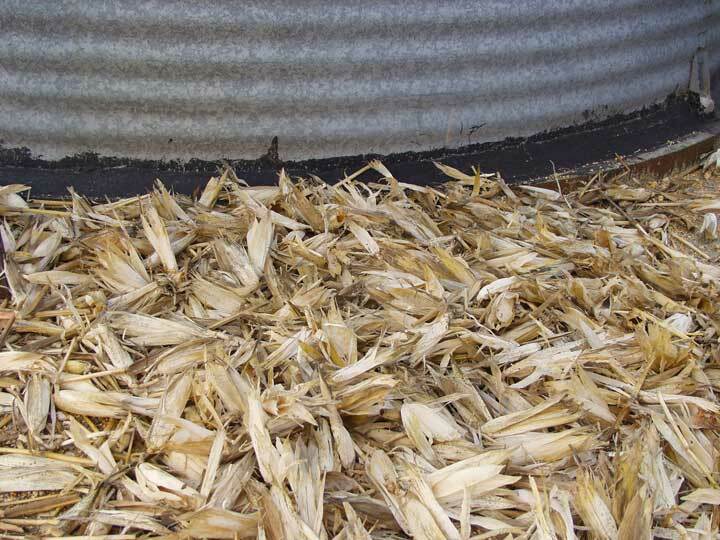 Inside the Uniharvester are rollers which remove the stalks from the cobs. 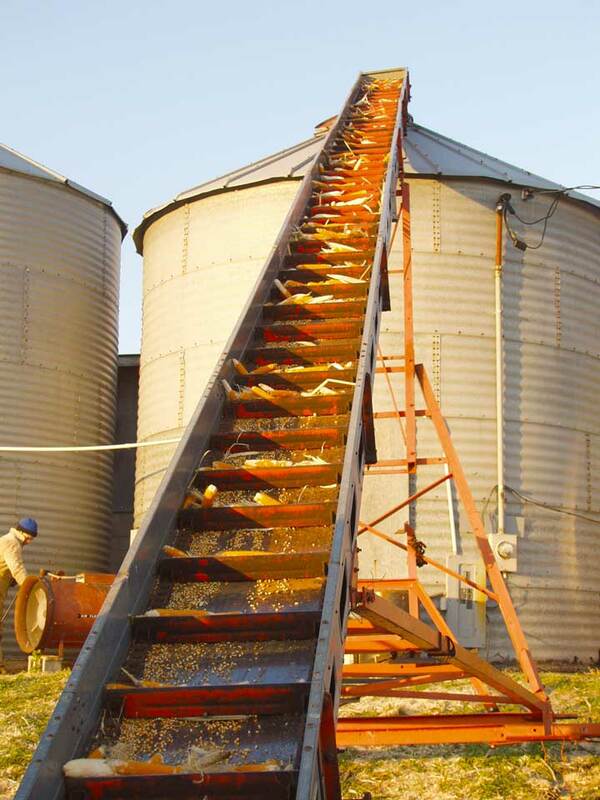 The stocks drop to the ground and the cobs go up an elevator. 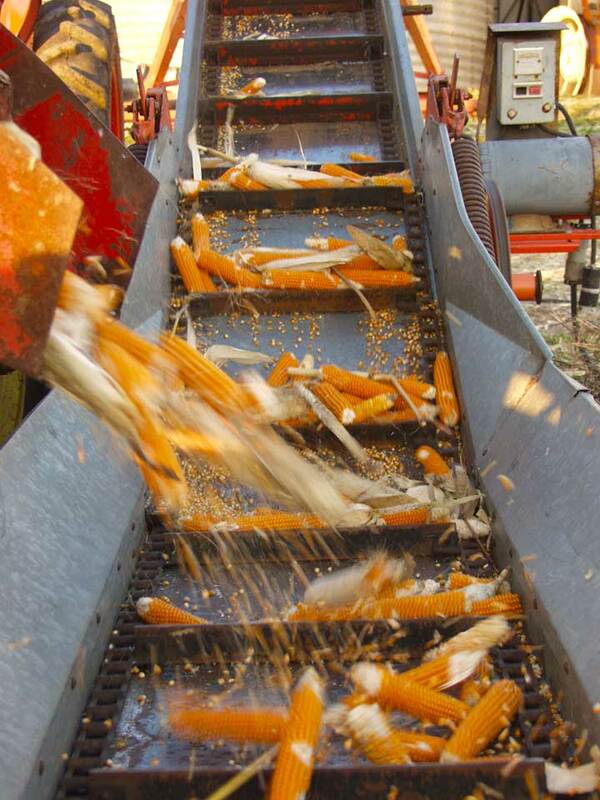 At the end of the elevator the cobs drop down into a wagon pulled by the Uniharvestor. It's a beautiful day for harvesting, it's wonderful to be outside when it's crisp and sunny and not too cold! 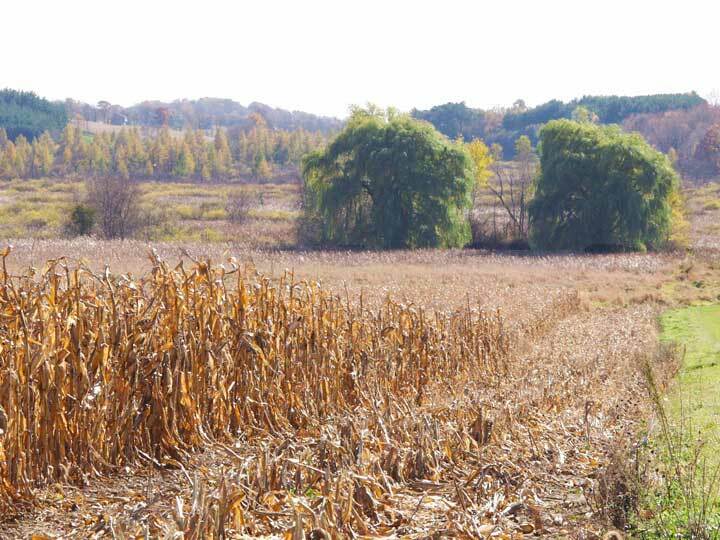 Here's what our Mushroom Flake popcorn field looks like in November as we are harvesting. 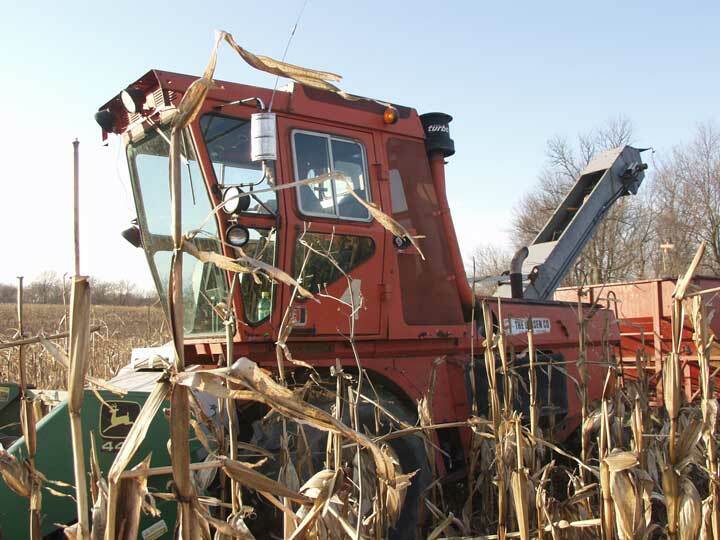 The long rows of stalks are mesmerizing as they fall in order onto the green teeth of the uniharvester. The loud munching noise of the harvester is like a strange heartbeat. 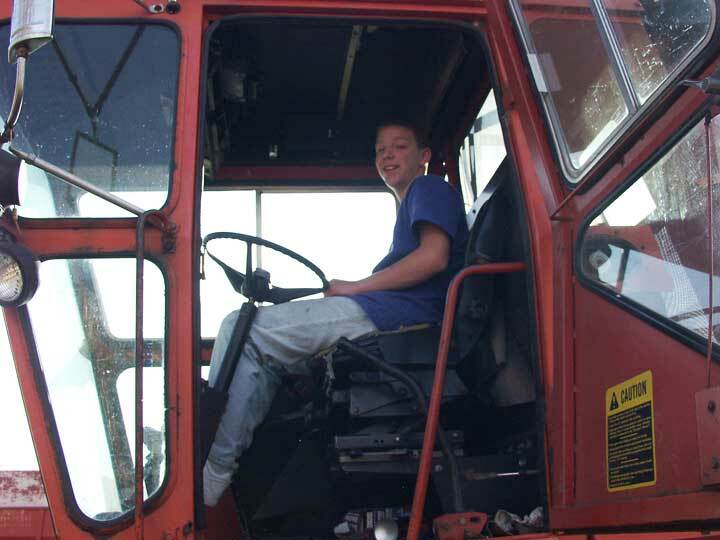 Christopher in the cab of the Uniharvester. Sometimes the popcorn is really tall! 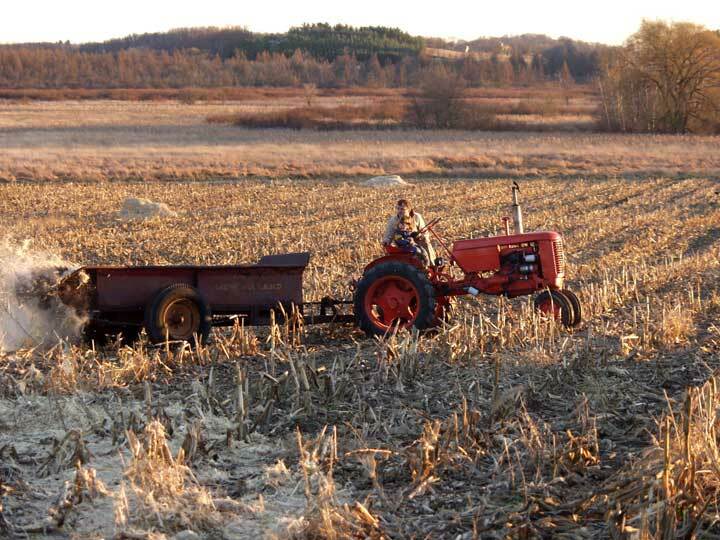 Above is a view of our Uniharvester in the field pulling the wagon. Actually, Christopher has to turn around to start down another stretch. It's 3:30 PM which is about an hour from sundown, but we will keep going until around 8:30 PM and unload the wagons with the help of a light. 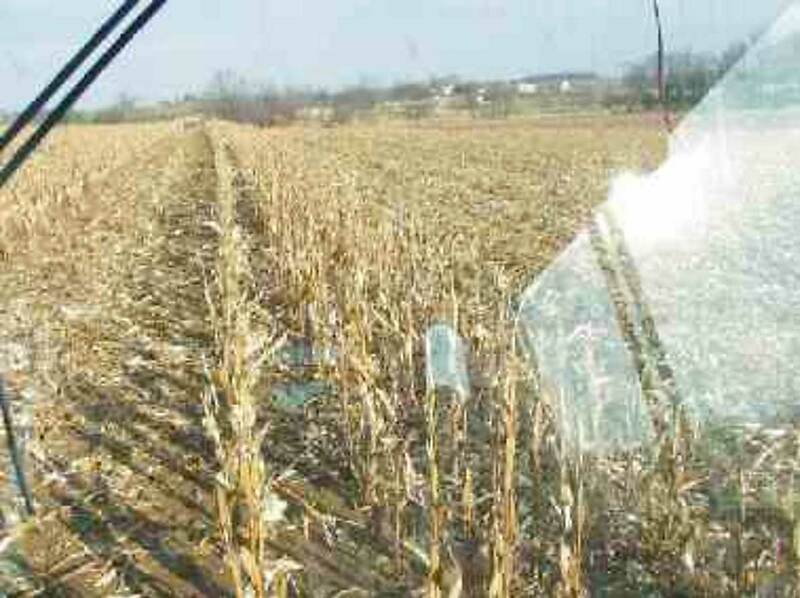 The harvester has good lights for seeing the rows, but you have to watch out for rocks! 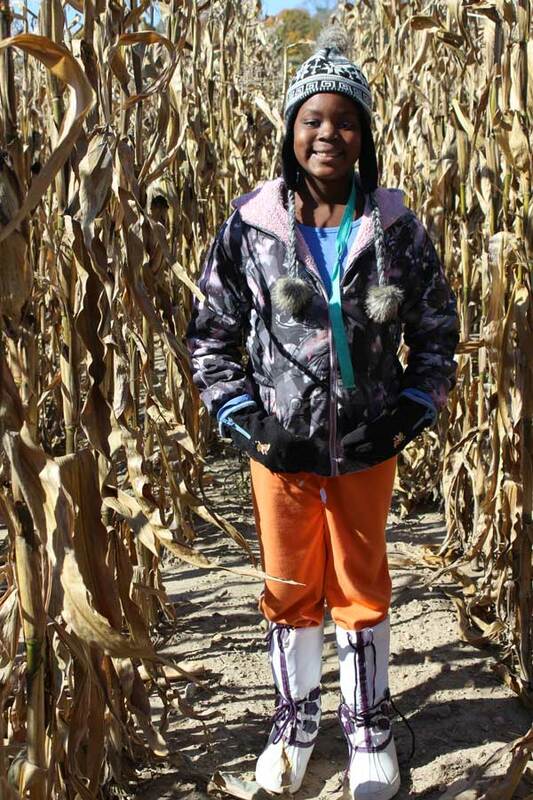 We talked about the "munching" noise it makes as the corn stalks go through. Can you imagine what it sounds like when it picks up a rock? 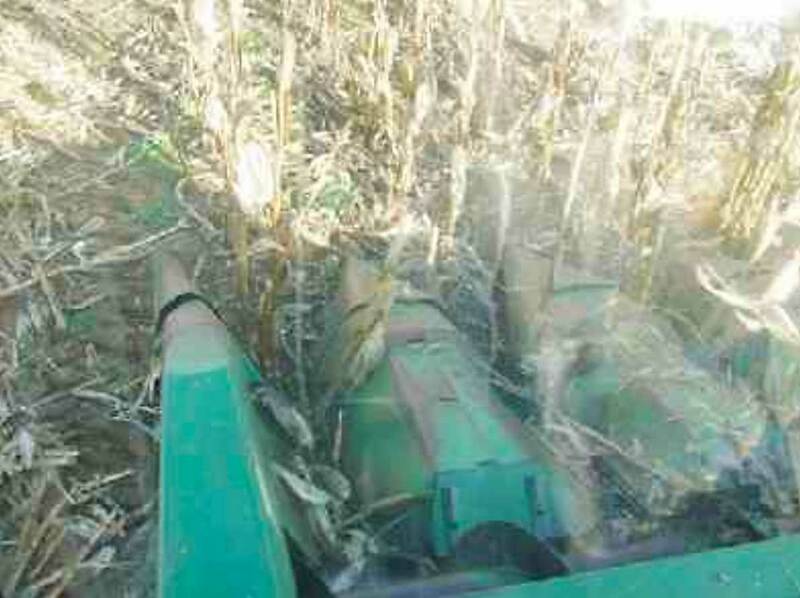 Rocks can do a lot of damage to the harvester. We have to stop quickly and get the rock out before it goes far in the machine. 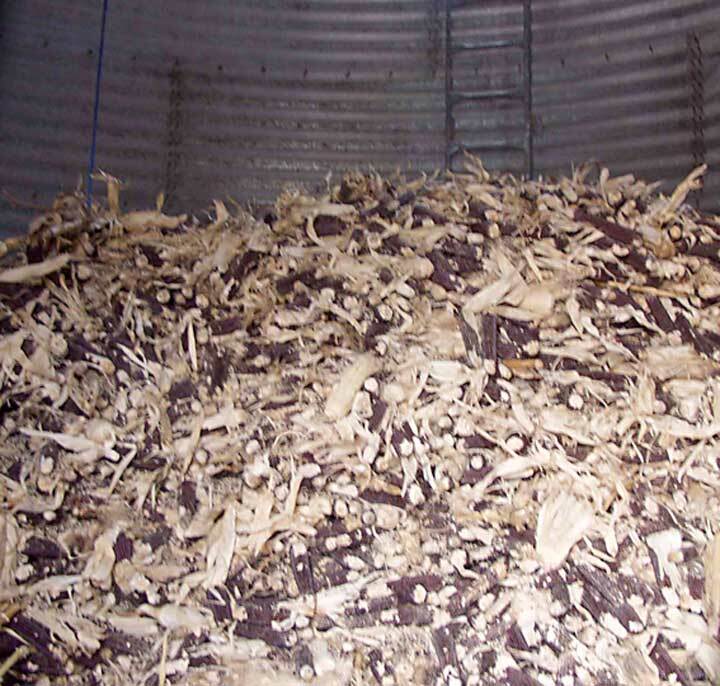 Inside the "Uni", this is Christopher's view as he is harvesting. Looking down you can see the corn stalks being picked up. It's always dusty in the cab. 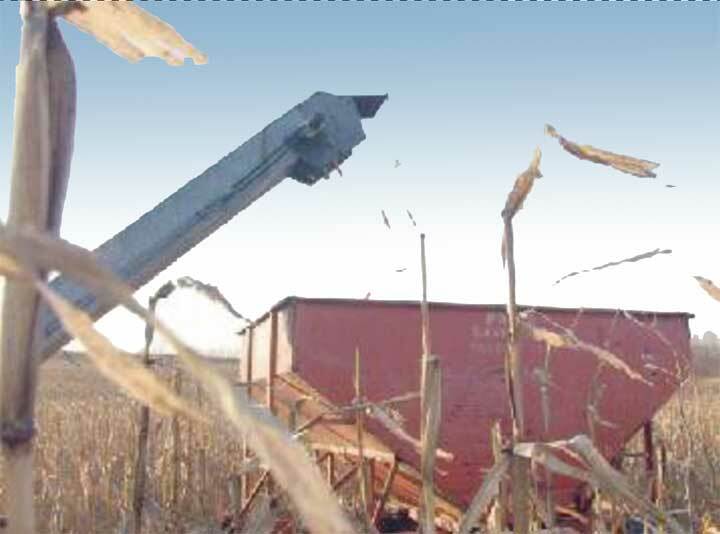 Here you can see the popcorn cobs spitting into the wagon from the end of the uniharvester elevator. Christopher has to look back from the cab to see how the wagon is filling. 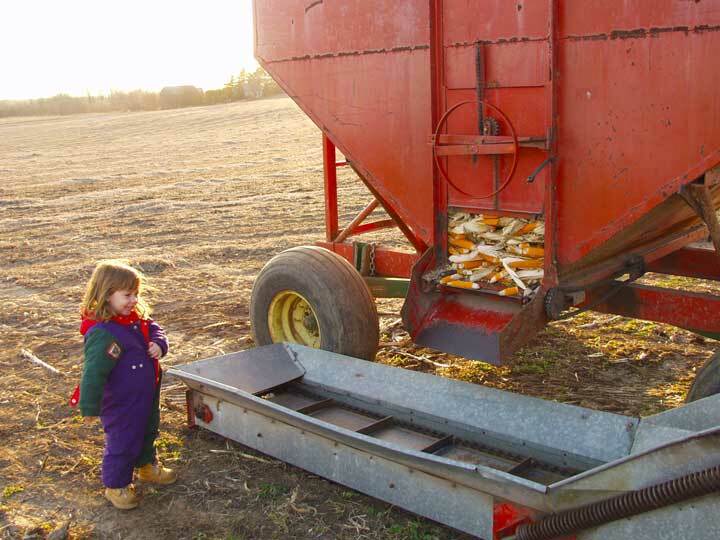 You don't want to overfill the wagon. 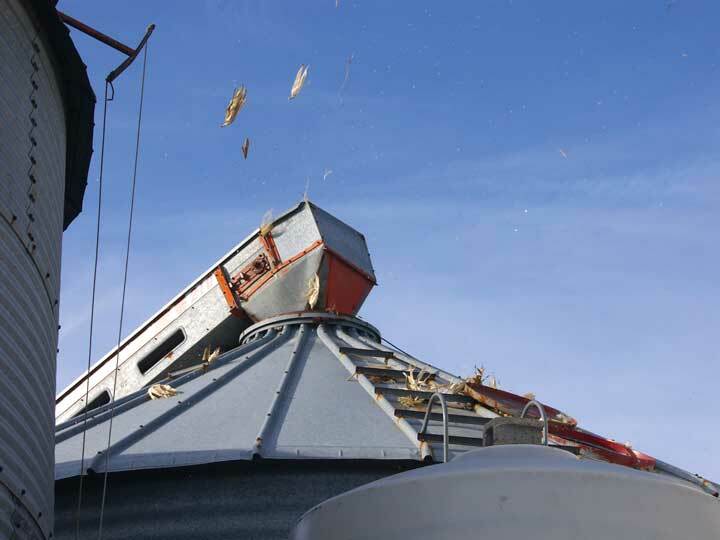 An overfull load is dangerous, and why pick the popcorn if you are going to spill it? 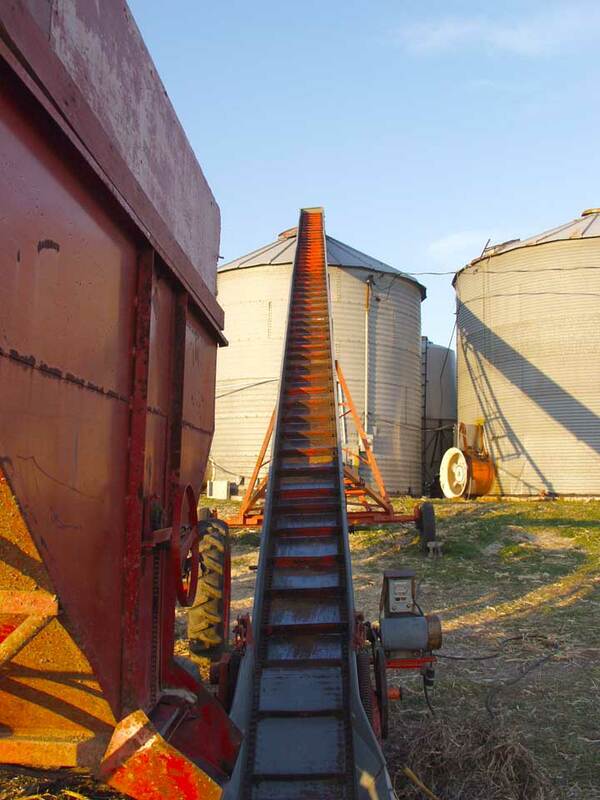 When the wagon is full, our pickup truck pulls it back to the farm where it's unloaded onto an elevator and dropped into a drying bin. The drying bin will push ambient temperature air through the popcorn in order to dry it enough so that it will pop and not spoil. 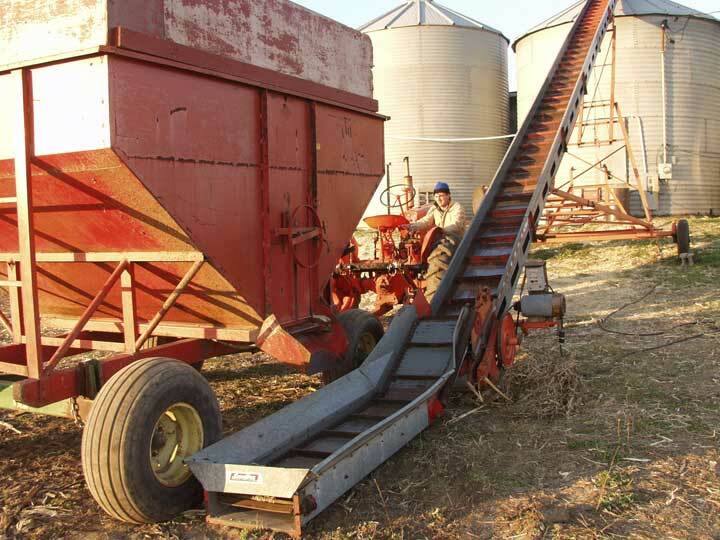 The wagon is pulled into place with the small tractor next to the elevator, close enough so that the popcorn can drop onto the drag line of the elevator. 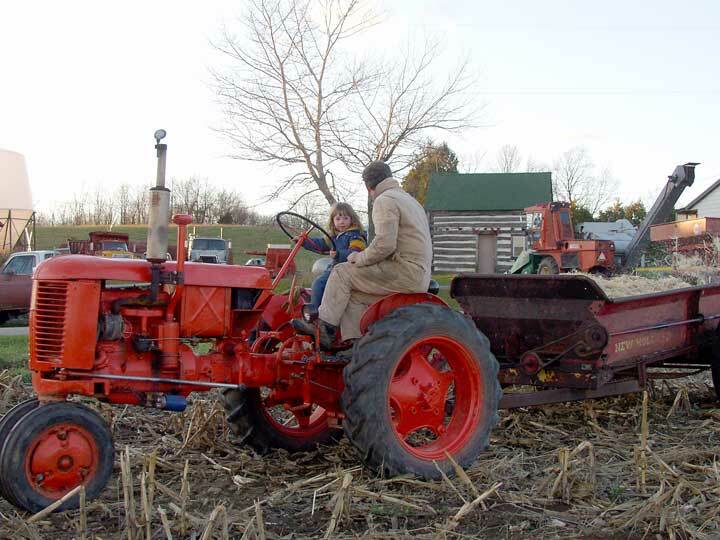 The wagon is a PTO powered self unloading wagon using the power of the tractor. The elevator is electric. Carl is turning on the PTO of the tractor. 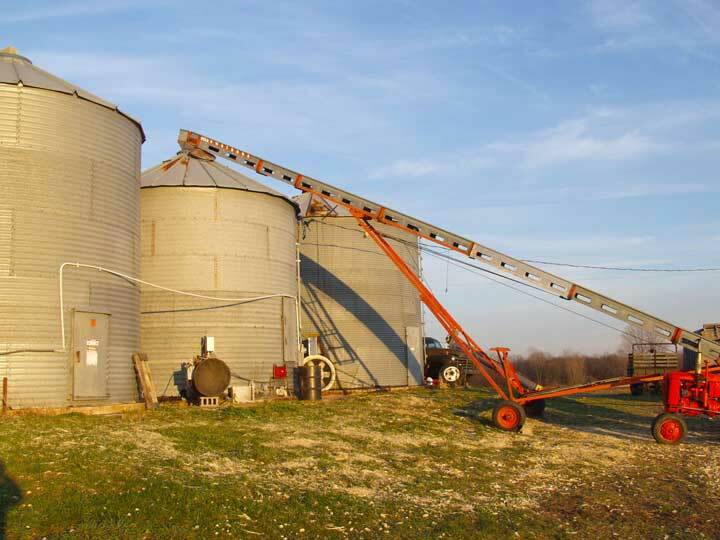 A long shot, showing how long the elevator has to be, reaching all the way to the top of the bin. A front view of the elevator right up to the top. Carl climbs this elevator to get to the top of the bin, or uses the ladder on the bin. The wagon slidegate is open, Dara is anticipating the first cobs to drop out. Carl pulls some out to get things started. It's a long way to the top. 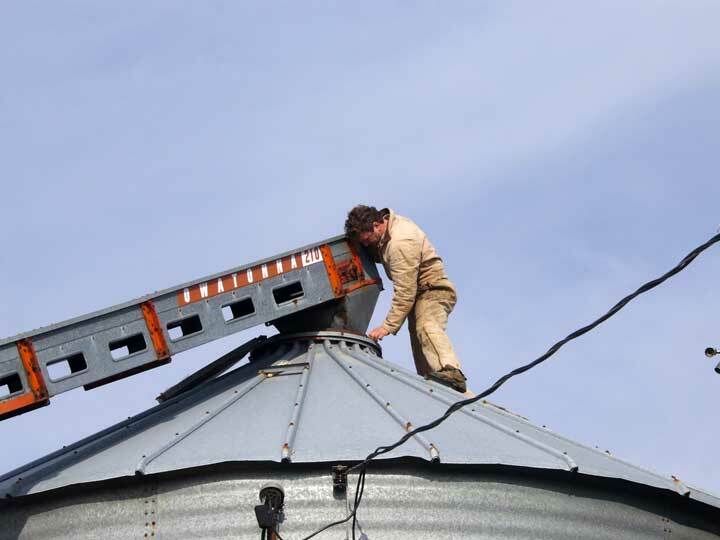 Carl is turning on the fan which blows the loose husks out of the top of the bin, letting the heavier popcorn cobs and kernels drop down. 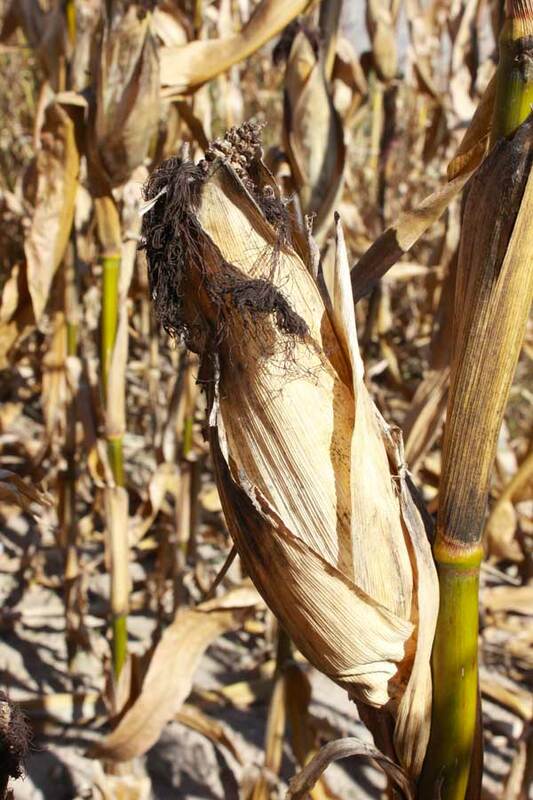 See the husks fly out! Where do they go? 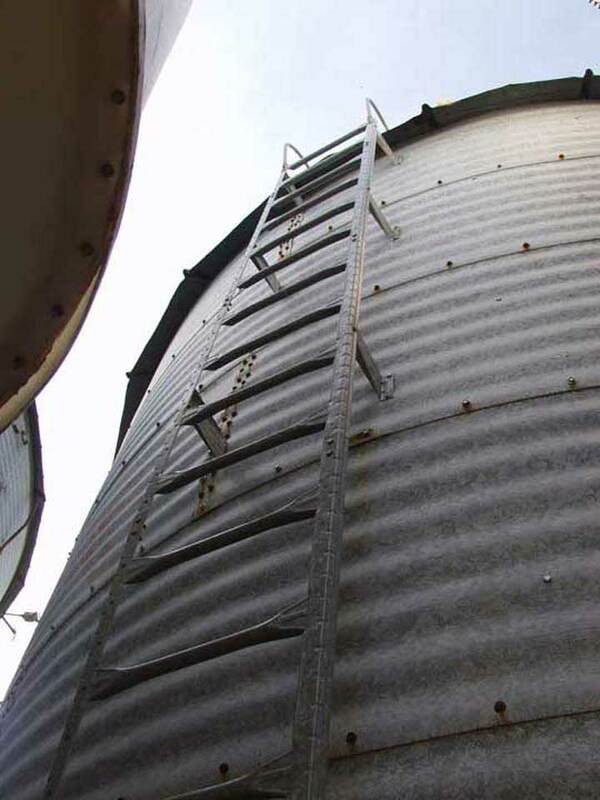 See the bin ladder. We have to climb into the bins frequently to check the status of the popcorn inside. Carl is on top of the bin adjusting the top of the elevator. It's dangerous but he is very, very careful. Here is a bin that has been partly filled with Midnight Blue popcorn. Guess what! This is where the husks have landed, and it's a mess. What do we do now! Here's what we do! 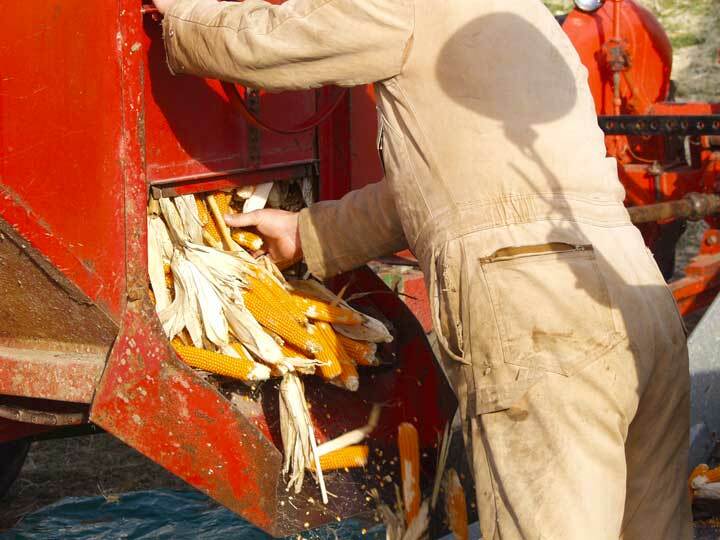 Dara and Carl are driving the manure speader full of corn husks out into the field. 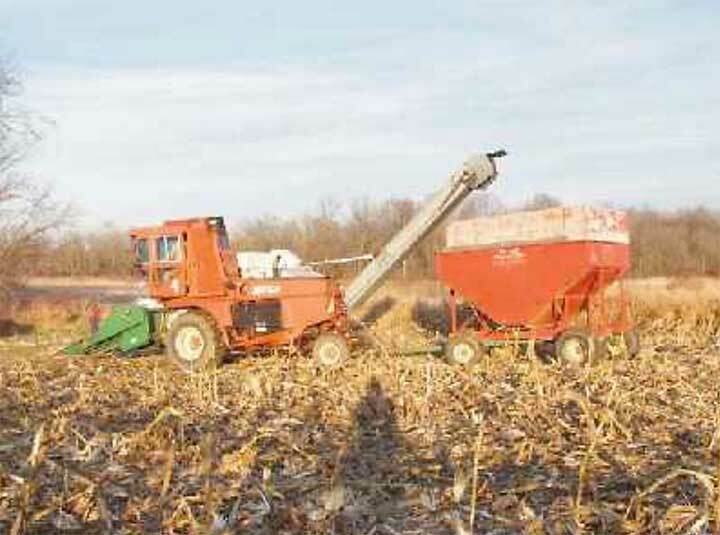 Who put them into the spreader? It was not the wind, we had to clean up with brooms. Dara and Carl are driving the spreader with the small Case tractor, see the dust coming out the back of the spreader from the husks.